Students interested in learning more about the Beinecke Scholarship and other prestigious awards should contact Megan Friddle in the National Scholarships and Fellowships Program. The same ear for music that made Emory College student Mallory Carnes an accomplished violist also gave her a gift for languages. While a future as a “starving” artist didn’t appeal to her — or her parents — a double major in Chinese and music has opened up the path to ethnomusicology. Now, as one of only 20 Beinecke Scholars selected this year, her academic career aspirations to study the music of different cultures, especially Asian cultures, is in sharp focus. The national award comes with $34,000: $4,000 now and the rest while attending the graduate school of her choice. The Beinecke Scholarship Program was established by the board of directors of The Sperry and Hutchinson Company to honor Edwin, Frederick and Walter Beinecke. The goal is to provide substantial scholarships for the graduate education of young men and women of "exceptional promise" and to encourage them to be "courageous" in selecting a graduate course of study in the arts, humanities and social sciences. Carnes is eyeing a doctoral program at Harvard, which admits just a handful of ethnomusicology students yearly, as well as several other top-flight schools. First, she plans to try for a Fulbright teaching fellowship after graduation next year. Those plans would fit among Carnes’ courageous acts in her college career so far. 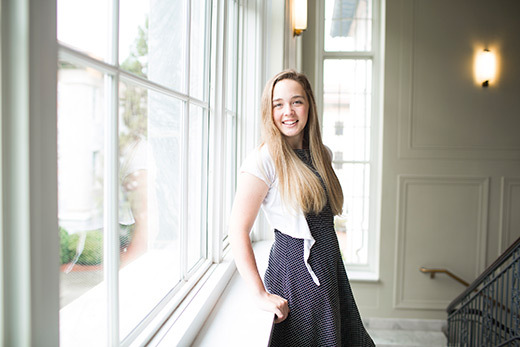 For instance, as a sophomore, she decided to tackle independent research on “Herzliebster Jesu,” a 17th-century German hymn with multiple English translations used by many Protestant denominations. Stephen A. Crist, associate professor of music history, says Carnes approached him during her sophomore year with the idea, after taking a Baroque music history course with him as a first-year student. The project called for her to analyze 120 different hymnals spanning several centuries, including a week of primary source research at the Leipzig Bach Archive in Germany. She had just one month to learn enough German, including Old German, to understand the text and music in the archives, Crist says. She came through and produced an 18,000-word manuscript — a typical project for a doctoral student that earned her a single credit of independent study. Carnes has applied a similar maturity and eagerness to her coursework and other undertakings. She earned a Woodruff Scholarship as a sophomore, a full-tuition award usually only awarded to entering first-year students. She is both a member of the Emory Symphony Orchestra and the manager of the Emory Youth Symphony Orchestra, for high school students. She also played in Peking University’s traditional Chinese music ensemble during a semester abroad last fall, the first non-Chinese student to do so. Carnes returns to China this summer for work on her senior honors thesis, which, true to her form, she began last year. Once there, she will get to attend a few large music festivals in Shanghai and interview concert-goers about their take on gender identity in Mandarin-language Chinese pop. She will need to conduct her interviews in a second language and do a similar deep dive on the lyrics, often written by men. Her theory is that the Cultural Revolution set back women as a visible gender to where they are now, just swinging back to being seen and heard, albeit only as hyper feminine. Such pithy observations can only come from the sophisticated understanding Carnes develops in all areas of interest, says history professor Mark Ravina. Ravina never taught Carnes in class but hired her as work-study assistant to work on the Journal of Asian Studies, where he is an editor. At the time, he was looking only for a student with some language skills and interest in the region. When he saw her set up a database of book reviewers and their projects for future issues in 15 minutes, he began giving her more responsibility. In no time she was editing submissions by top scholars in the field, where Ravina says his colleagues assumed, based on her editorial comments, that Carnes was an advanced graduate student, not a college sophomore. Carnes also began writing her own pieces comparing multiple books on core arguments or missing context, not for the journal but based on requests from Ravina. She has continued the work on the journal in her spare time, and Ravina co-sponsored her attendance to the recent Association of Asian Studies annual conference.